Syllabus of the Online Course (Subject): Cooperation Council of Turkic Speaking States (Turkic Council). Description of the Online Course: Cooperation Council of Turkic Speaking States. 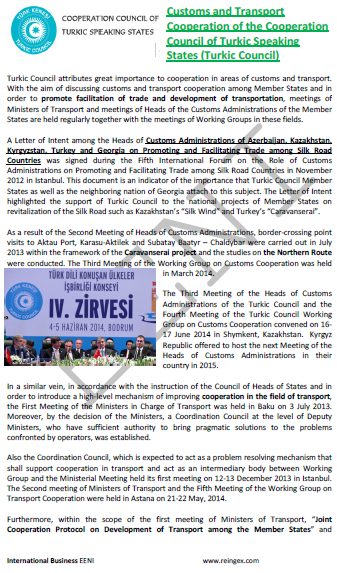 The Cooperation Council of Turkic Speaking States, or Turkic Council, is a Eurasian intergovernmental body founded in 2009 by Azerbaijan, Kazakhstan, the Kyrgyz Republic, and Turkey. The main objective of the Turkic Council is to encourage economic and cultural cooperation between the Turkic Speaking States in Central Asia and the Caucasus. These four Turkic Speaking Countries share a common language, culture, religion (Islam), and history. The economic cooperation between the states of the Turkic Speaking covers customs, tourism, education, economy, foreign trade, Foreign direct investment (FDI), and transport. The profile of the Cooperation Council of Turkic Speaking States (Turkic Council). The Cooperation Council of Turkic Speaking States belongs to Central Eurasian Economic Area (Islamic Civilisation).